Home: Thompson IM Funds, Inc.
Each Fund’s closing net asset value on the distribution date will be reduced by the distribution plus or minus any market activity for the day. Please consult your tax advisor for information specific to your situation. Detailed information is on each Fund’s Distribution History page. Please click the ticker symbols in the chart above for standardized performance. Performance data quoted represents past performance: past performance does not guarantee future results. The investment returns and principal value of an investment will fluctuate so that an investor's shares, when redeemed, may be worth more or less than their original cost. Current performance of the Fund may be lower or higher than the performance quoted. Performance data current to the most recent month-end may be obtained by clicking the following links: THPGX, THPMX and THOPX. Mutual fund investing involves risk, principal loss is possible. Investments in debt securities typically decrease in value when interest rates rise. The risk is usually greater for longer-term debt securities. Investments in asset-backed and mortgage-backed securities include additional risks that investors should be aware of such as credit risk, prepayment risk, possible illiquidity and default, as well as increased susceptibility to adverse economic developments. Investments in bonds of foreign issuers involve greater volatility, political and economic risks, and differences in accounting methods. Investment by the Fund in lower-rated and non-rated securities presents a greater risk of loss to principal and interest than higher-rated securities. Results include the reinvestment of all dividends and capital gains distributions. 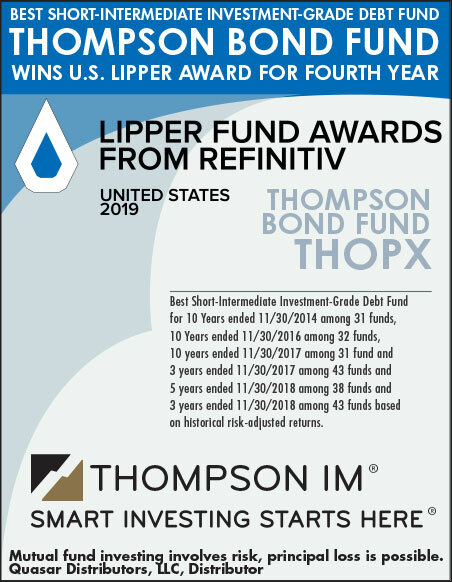 The Thomson Reuters Lipper Fund Awards, granted annually, highlight funds and fund companies that have excelled in delivering consistently strong risk-adjusted performance relative to their peers. The Lipper Fund Awards are based on the Lipper Leader for Consistent Return rating, which is a risk-adjusted performance measure calculated over 36, 60 and 120 month,. The fund with the highest Lipper Leader For Consistent Return (Effective Return) value in each eligible classification wins the Lipper Fund Award. For more information, see www.lipperfundawards.com. Although Lipper makes reasonable efforts to ensure the accuracy and reliability of the dale contained herein, the accuracy is not guaranteed by Lipper. From Refinitiv Lipper Awards, ©2019 Refinitiv. All rights reserved. Used by permission and protected by the Copyright Laws of the United States, The printing, copying, redistribution, or retransmission of this Content without express written permission is prohibited. The Thompson IM Funds are offered only to United States residents, and information on this site is intended only for such persons. Nothing on this web site should be considered a solicitation to buy or an offer to sell shares of any Thompson IM Fund in any jurisdiction where the offer or solicitation would be unlawful under the securities laws of such jurisdiction. Before you invest in the Funds, please refer to the prospectus for important information about the investment company, including investment objectives, risks, charges and expenses. You may also obtain a hard copy of the prospectus by calling 1-800-999-0887 . The prospectus should be read carefully before you invest or send money.